Healthy trees are safe trees, and they add beauty to your yard. But when they become diseased, they can be weakened, are prone to limb breakage, and might even fall (perhaps in the worst way). Since tree diseases pose not only a danger to the tree, but to your home and family, learning to spot the signs of a problem is essential. Luckily, it’s also quite easy in most cases. The following nine tree diseases are some of the most common ones. An expert is required to accurately diagnose your problem, but this brief guide can give you an idea of the most obvious signs of a problem. Fire blight. This has nothing to do with an actual fire, but if your trees look charred or burned, they might have contracted this bacterial disease. Gall. This fungus usually grows on the trunk or branches of mature trees, and often looks like a tumor. Cankers. These show up as whitish growth’s along the trunk. Leaf rust. You might notice orange or reddish (rust colored) spotting on leaves. Leaf spot. 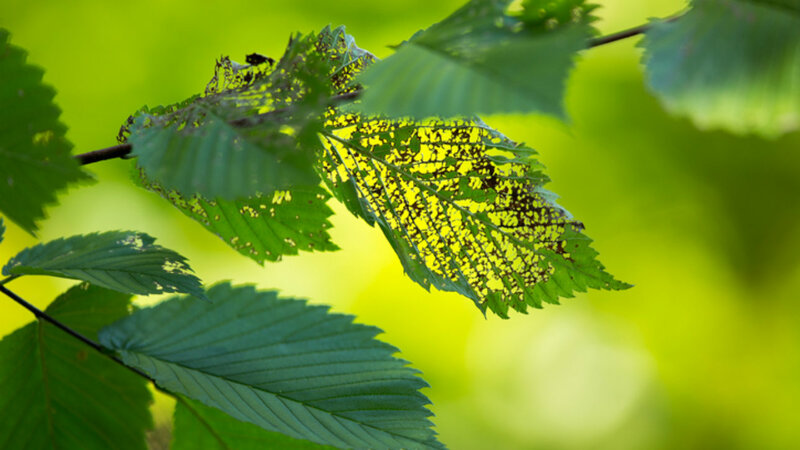 Small, round spots of discoloration on leaves are often caused by a parasitic fungi or bacteria. If the spots are plentiful they might grow together into larger patches. Japanese beetles. These aren’t actually a disease, but an infestation of Japanese beetles can wreak havoc on your trees. They eat leaves, which will weaken your trees. Their feeding will leave you with lacy leaves, with only the veins remaining, and of course you will probably see the beetles themselves. Powdery mildew. Leaves that appear dusty or white indicate a fungal disease called powdery mildew. Bagworms. These caterpillars make spindle-shaped bags, 1.5 to 2 inches in length, that hang from the twigs of trees and shrubs. While they look like harmless little pinecones, a large infestation of bagworm larvae can strip the needles of evergreen trees and the leaves of some deciduous species. Witch’s broom. This deformity will be found in your tree branches, and looks like a dense mass of shoots coming from a single point. Essentially, it looks like a broom. It’s caused by stress from pests or diseases, so technically it’s just a sign that we need to figure out what else is afflicting your tree. This brief guide can help you understand what might be going on with your trees. However, we urge you not to diagnose problems yourself, because a wrong diagnosis could lead to a wrong or ineffective treatment. Give us a call, and we can help you determine whether your tree can be saved. If it does need to come down, we can get that job done for you swiftly and safely, and sometimes spread of the disease (to your other trees) can be prevented.